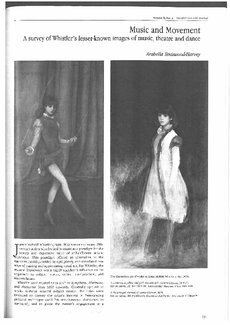 Discusses James McNeill Whistler's (1834-1903) paintings of dancers, musicians and performers. The author outlines his interest in music and theatre, with reference to 'Symphony', 'Harmony' and 'Nocturne', 'Musicians' (1849-51), 'Jen Bugs' (1852-53), 'At the Piano' (1858-59), 'Arrangement in Black No. 3: Sir Henry Irving as Philip II of Spain' (1876-85), 'Arrangement in Black: Portrait of Señor Pablo de Sarasate' (1884), and 'Beauty and the Butterfly', studies 'Music and Morals' (1871), and examines the oil paintings 'Harmony in Yellow and Gold: The Gold Girl-Connie Gilchrist' (1876-77; illus.) and 'The Blue Girl: Portrait of Connie Gilchrist' (1879; col. illus. ), with reference to Frederic Leighton's 'The Daphnephoria' shown at the Royal Academy in London (1876). She comments on Whistler's sketches for the Gaiety Theatre in London, including productions of 'Little Doctor Faust' and 'The Grasshopper', assesses the oil painting 'Harmony in Blue: the Duet' (c. 1878; col. illus.) and 'Souvenir of the Gaiety' (1878), and traces his painting of the artist Matthew Ridley (1837-1888) as a musician in the drypoint 'The Guitar Player' (1875; illus.). She reflects on the guitarist in the watercolor 'Gold and Brown: The Guitar Player' (c. 1885; col. illus. ), analyses Whistler's depiction of dancers in the pastel 'Note in Blue and Opal' (1885-86; col. illus. ), the charcoal and pastel 'The Tambourine' (c. 1900-1902; col. illus. ), the drawing 'A Girl Kicking a Tambourine' (1900-1902) and the watercolor 'A Dancing Woman in a Pink Robe, Seen from the Back' (c. 1888-1890; col. illus. ), and concludes by studying his depiction in the 1890s of the American dancer Loie Fuller, emphasizing the Symbolists interest in her dancing and works by Henri Toulouse-Lautrec.